Three months ago, I couldn't have told you where Rwanda is on a map or even how to spell it. But that all changed when I got a copy of Left to Tell: Discovering God Amidst the Rwanda Holocaust by Immaculee Ilibagiza and Steve Erwin. This is an amazing book, not because someone was able to survive being locked in a small bathroom with six other women for 91 days, but because God could use such terrible circumstances to show Himself as a loving God and enable a person the grace of forgiveness when most of her family was murdered. Immaculee didn't waste any of the time she hid from Hutu killers, just outside the bathroom window. She used the time to go deep in prayer, with her rosary and later a bible she was given. After reading this book, and I had to know more of the story. I then read Led by Faith: Raising from the Ashes of the Rwandan Genocide. This book tells many of the stories of what happened after the holocaust as Rwanda tried to recover and heal. Immaculee shares candidly about the lives of the survivors and how dangerous and poverty stricken it was. I really liked this book because of her examples of expectant faith. Many difficulties she faced, she turned over to God in prayer and relied on His Divine Providence. These examples really inspired me to pray more and to trust more. 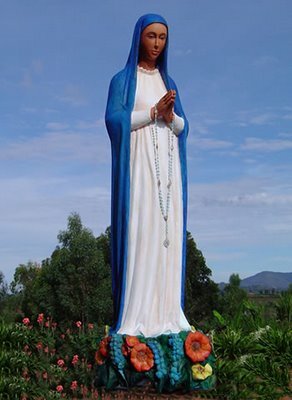 And blow me away with the third book Our Lady of Kibeho: Mary Speaks to the World from the Heart of Africa. In this book, Immaculee shares the appearances of Our Lady in Rwanda to school girls in the 1980s. Approved by the Catholic Church, these apparitions, like those in Lourdes and Fatima gave the message to pray and repent. I am looking very forward to the release in August of her next book: The Rosary: The Prayer that Saved My Life.